According to the CalFlora website (http://www.calflora.org/), 21 species of amaranths occur (to some extent) in California. While many are non-native, a few, including prostrate pigweed (Amaranthus blitoides) and Palmer amaranth (Amaranthus palmeri), are indigenous. While it may be convenient to lump all of the genus Amaranthus together when considering weed management options, proper identification is important for understanding the potential for crop yield loss (not all amaranths were created equal with respect to competitiveness) and the possibility of herbicide resistance (populations of Palmer amaranth with resistance to glyphosate have been confirmed in the state), etc... 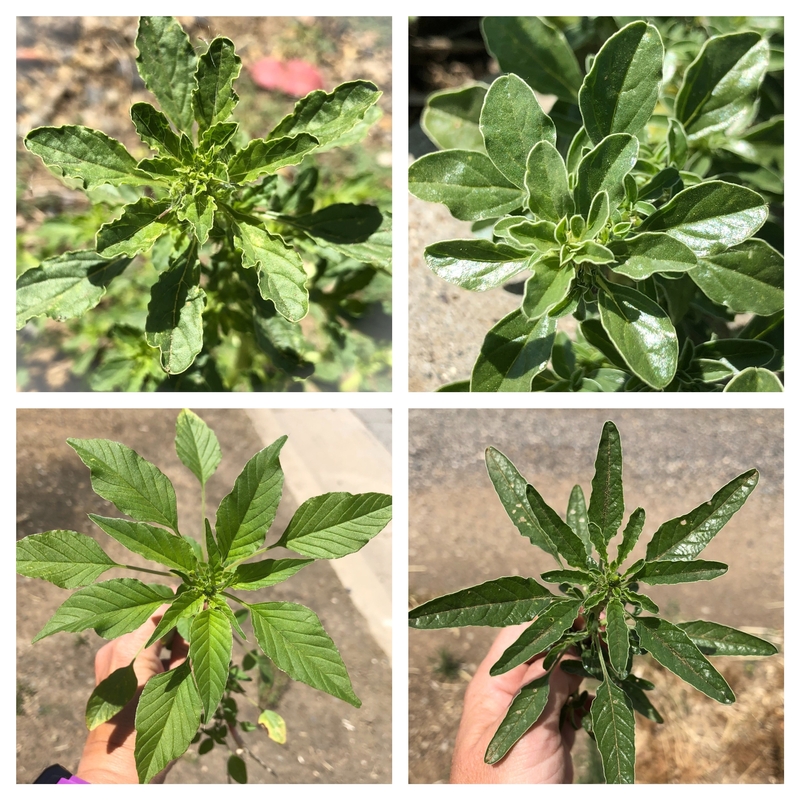 This post will, hopefully, help you to distinguish between five weedy amaranths: redroot pigweed (Amaranthus retroflexus), prostrate pigweed (Amaranthus blitoides), tumble pigweed (Amaranthus albus), waterhemp (Amaranthus rudis), and Palmer amaranth (Amaranthus palmeri). 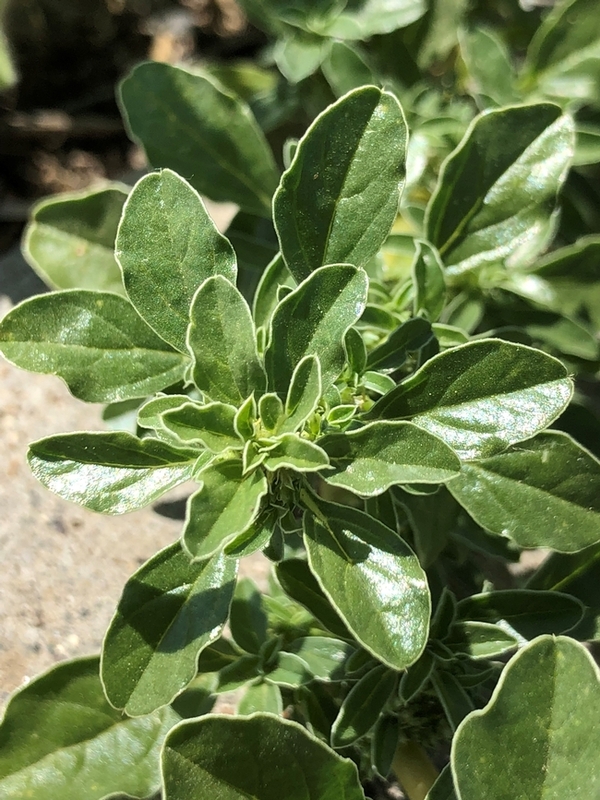 So, you are looking at a plant that has 1) alternating leaves that are notched at the tips, 2) nondescript green flowers, 3) and that is producing prodigious amounts of small, shiny, black seeds. 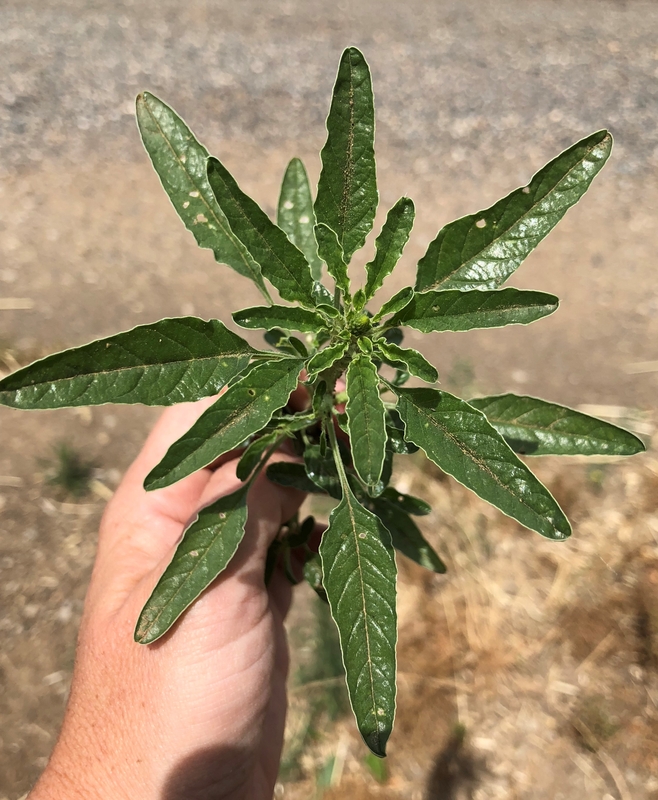 You are pretty sure that you are looking at a pigweed but you aren't sure which one. How can you tell them apart? What combinations of traits separate one species from another? Below are some identifying characteristics to help you when making your decision. Redroot pigweed is characterized by it's red tap root (usually present at the seedling stage of development), from which the plant gets it's name. Plants are erect and usually around 3-4' in height, although they can grow larger. 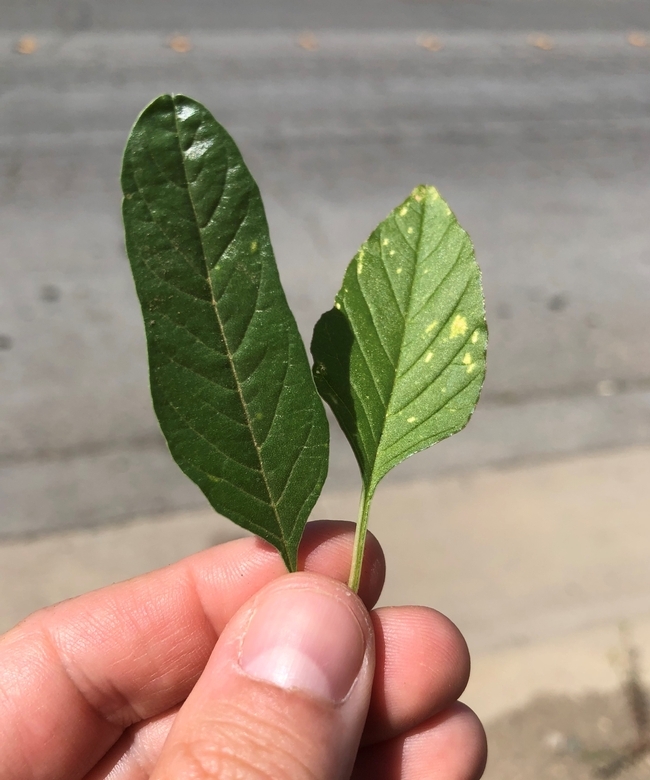 Leaves are round to oval in shape and have prominent veins; both leaves and stems are covered in fine hairs (pubescent). Young leaves may appear purplish on the underside. 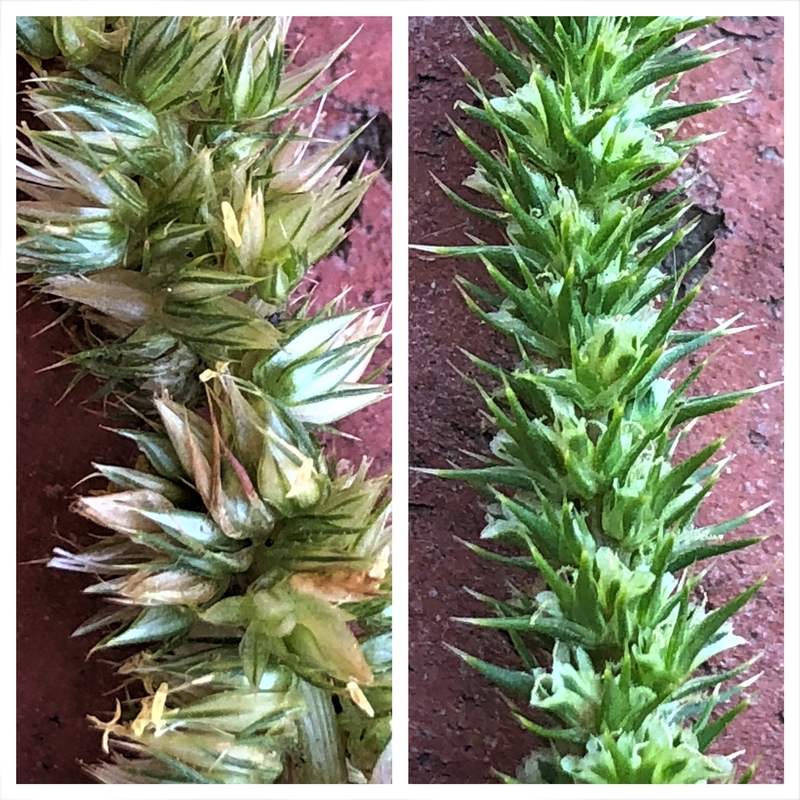 Male (staminate) and female (pistillate) flowers are produced on the same plant (defined as being monoecious) in terminal flower spikes that are comprised of short, thick branches. 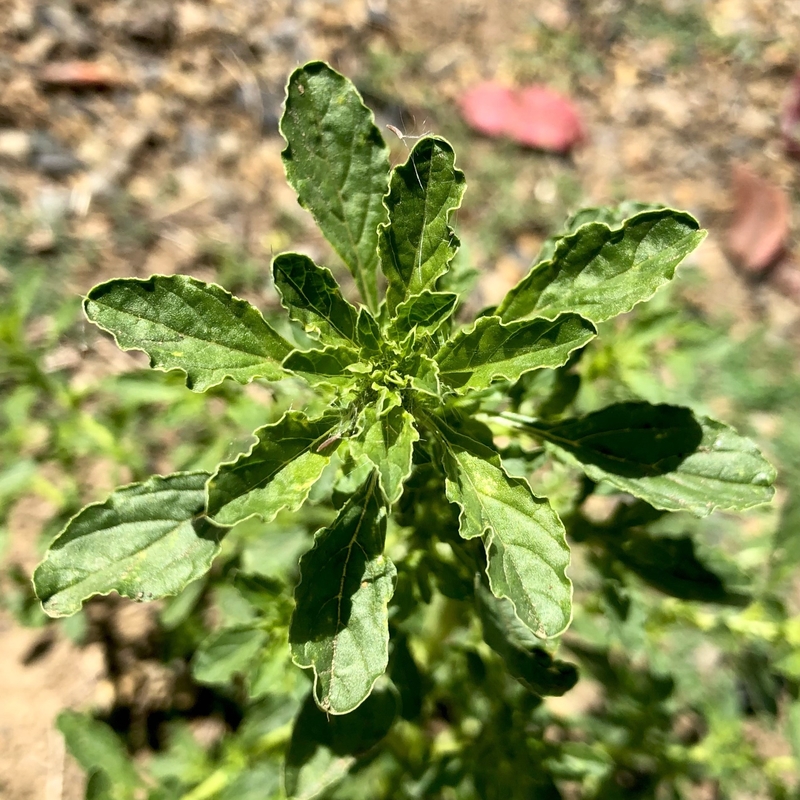 NOTE: According to Ellen Dean of the UC Davis Center for Plant Diversity notes that redroot pigweed can be mistaken for other species including Amaranthus hybridus (smooth pigweed), which has long-pointed sepals as compared to redroot's rounded sepals. Please see the UC IPM website for more information about redroot pigweed: http://ipm.ucanr.edu/PMG/WEEDS/redroot_pigweed.html . 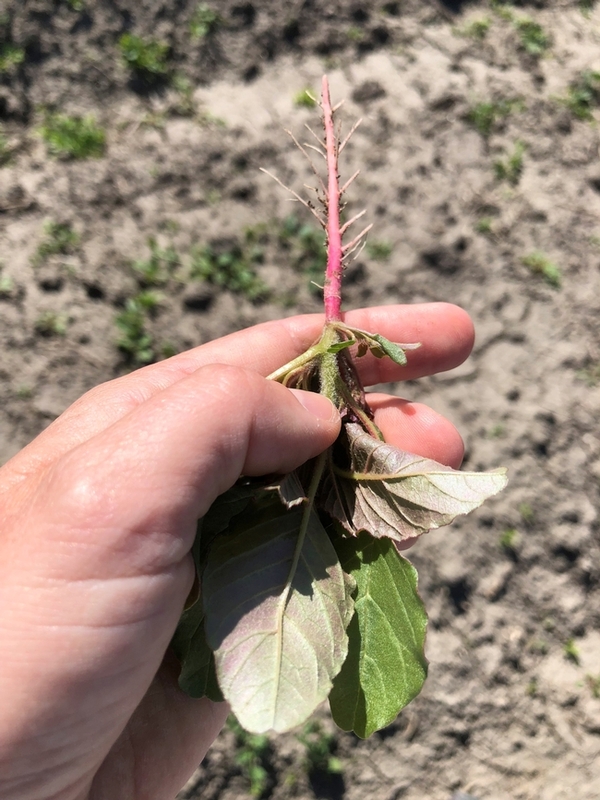 Red coloration on the root of a young redroot pigweed plant. If you look closely, you can also see some fine hairs on the stem of the plant, which give it it's rough appearance. 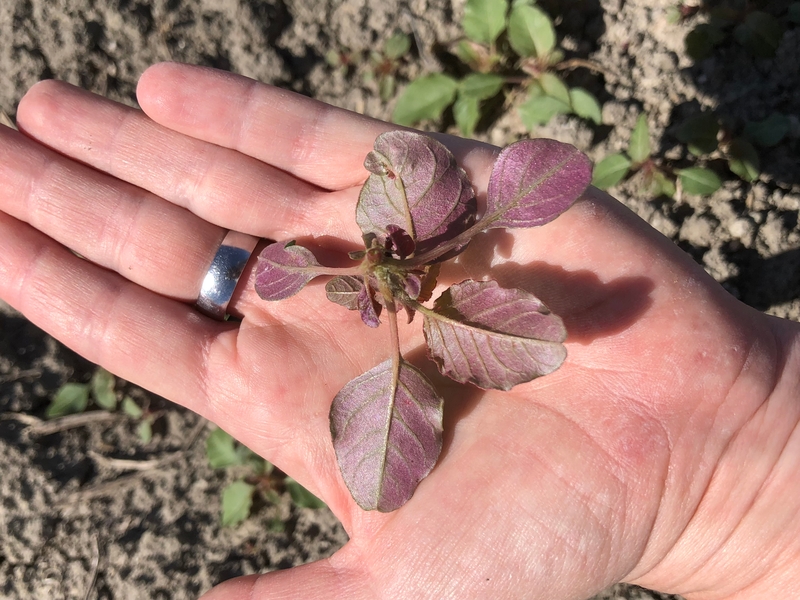 Leaves of redroot pigweed are round to oval in shape; young leaves may be purple on the underside. Like it's name suggests, prostrate pigweed has a very flattened (as opposed to erect) growth habit. Just because it is flat doesn't mean that the plant is small, though; branches can be up to 2' in length. Leaves are somewhat spoon-shaped (narrower at the base), small (<1.5" long), and are often dark green and waxy-looking. Stems are mostly smooth, fleshy (succulent), and often red in color. Male and female flowers are produced on the same plant, but not in terminal spikes; instead, the flowers of prostrate pigweed are produced in clusters in the leaf axils. 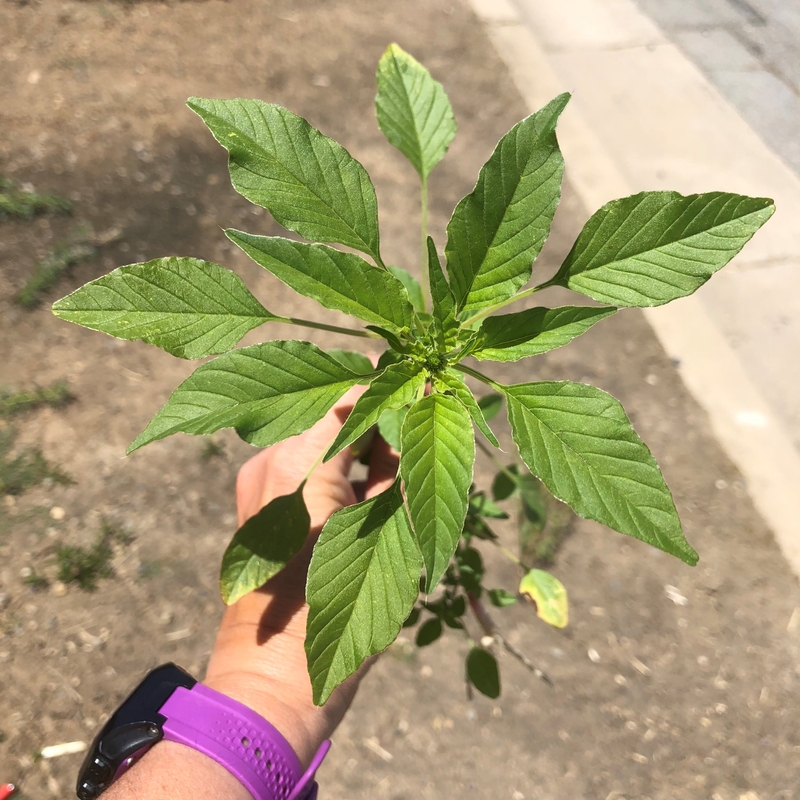 The Illinois wildflower website has more information about this species at: http://www.illinoiswildflowers.info/weeds/plants/pros_pigweed.htm. Prostrate pigweed leaves are small, narrow at the base, and waxy in appearance. 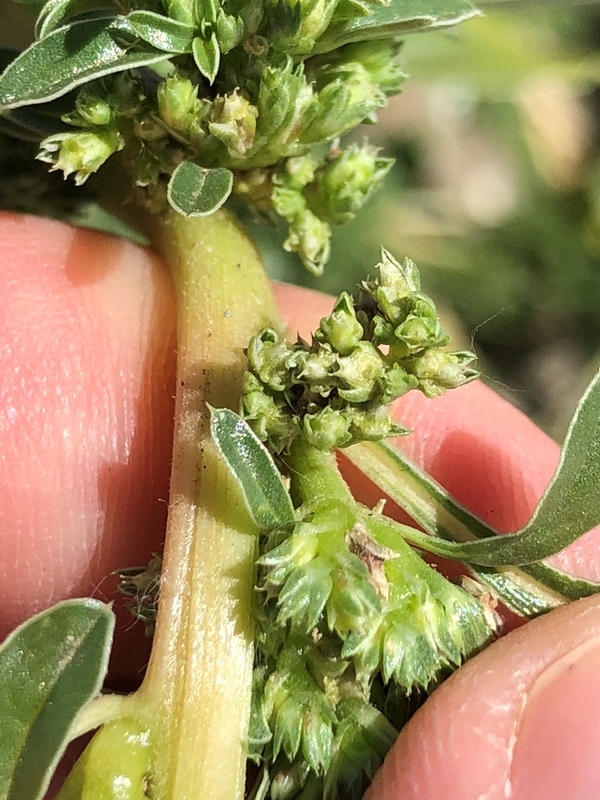 Prostrate pigweed flowers are produced in clusters in leaf axils. 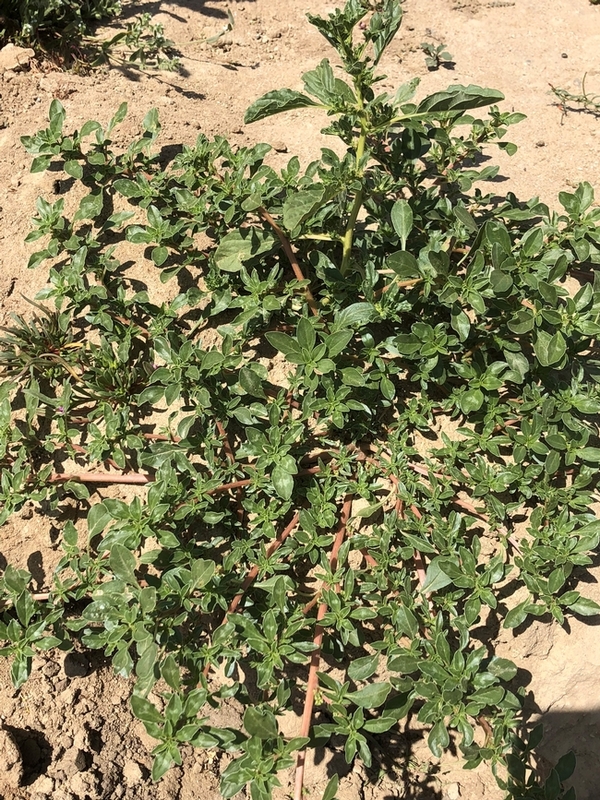 Prostrate pigweed has a flattened growth habit and reddish to red stems. Tumble pigweed is shrubby in habit; the plant grows to heights of about 3' and can be highly branched. Leaves can be small (<1.5" long), are egg-shaped, and may have wavy edges. Stems and leaves are light green in color. Like prostrate pigweed, the species is monoecious with flowers produced in spiny clusters in leaf axils (not in terminal flower spikes). 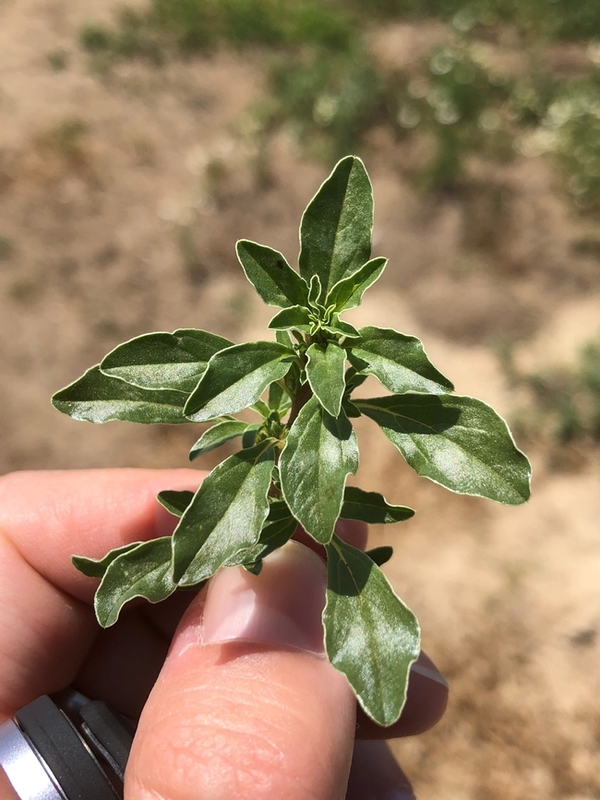 Additional information describing the differences between tumble and prostrate pigweeds can be accessed here: http://drkaae.com/Weeds2011/Pigweed.htm. Tumble pigweed leaves are light green in color, oval to egg-shaped, and have wavy edges. 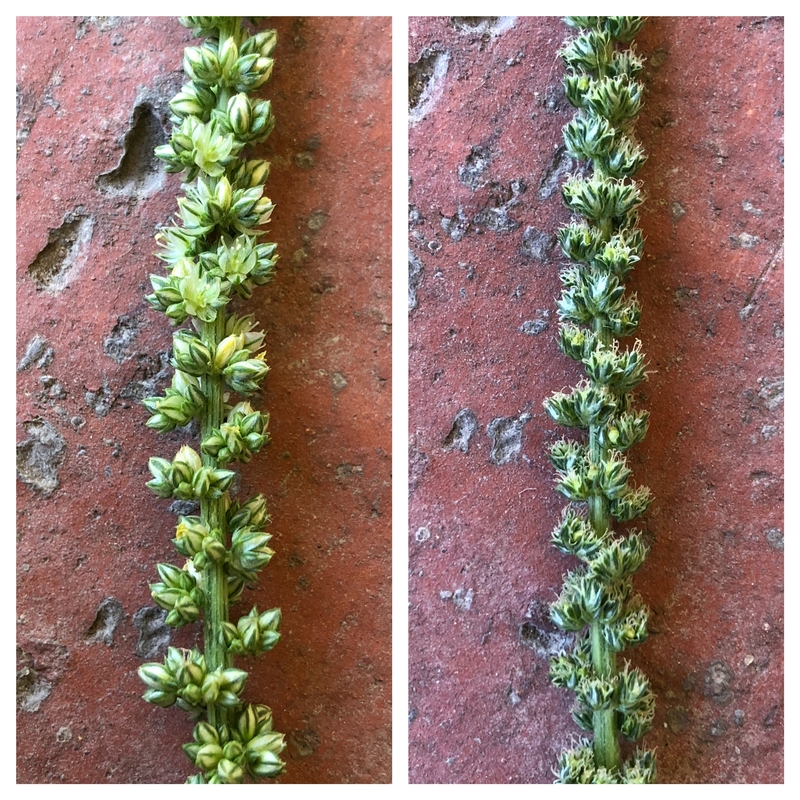 Tumble pigweed flowers are produced in spiny clusters in leaf axils. Note the lack of sharp bracts with prostrate pigweed. Waterhemp is an upright/erect pigweed species (growing to heights of 5-7'). The stems are smooth (hairless) and range from green to red in color. Although leaf shape can be variable, most leaves (especially older ones) are long and slender/narrow; leaves are typically dark green and shiny. Unlike redroot, prostrate, and tumble pigweeds, waterhemp produces male and female flowers on separate plants (defined as being dioecious). Flowers are primarily produced on long (up to 1' or more in length) and minimally branched, terminal flower spikes or on spikes that arise from upper leaf axils. For more information about waterhemp, please see the following website: http://www.illinoiswildflowers.info/weeds/plants/water_hemp.htm. Waterhemp leaves are dark green, shiny, hairless, and slender. Waterhemp stems are smooth/hairless and can vary with respect to color. Male (left) and female (right) waterhemp flowers are produced in terminal flower spikes that are held on separate plants. Palmer amaranth is also an erect pigweed species (growing to heights >6-8'). 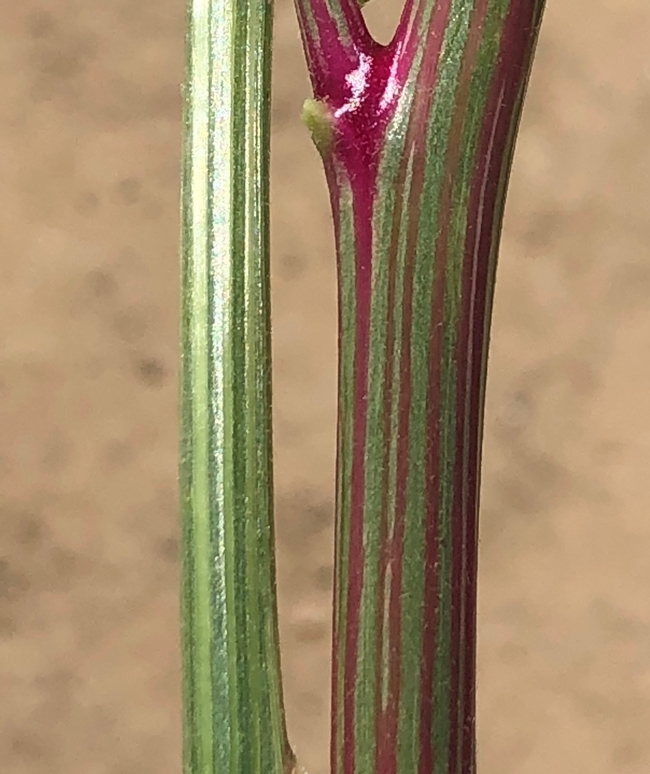 Like waterhemp, the stems are hairless and range from green to red in color. Leaf shape can be variable, but most leaves are egg-, diamond-, or lance-shaped; leaves may sometimes exhibit a white or purple, chevron-shaped watermark on them. Leaf petioles (especially on older leaves) are as long or longer than the leaf blades. Palmer amaranth also produces male and female flowers on separate plants (dioecious). Flowers are primarily produced on long (up to 2-3' or more in length) and minimally branched, terminal flower spikes or on spikes that arise from upper leaf axils. 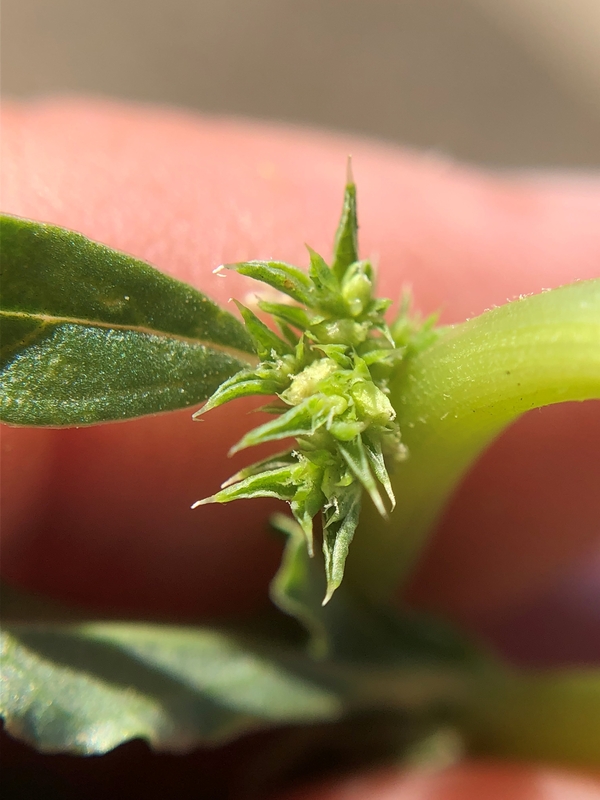 Female Palmer amaranth flowers can be distinguished from waterhemp by the presence of sharp bracts.For more information about Palmer amaranth and how to distinguish it from Waterhemp, please see the following website: https://www.extension.purdue.edu/extmedia/WS/WS-51-W.pdf. Palmer amaranth leaves. Some people note that the leaf arrangement resembles that of a pointsettia. 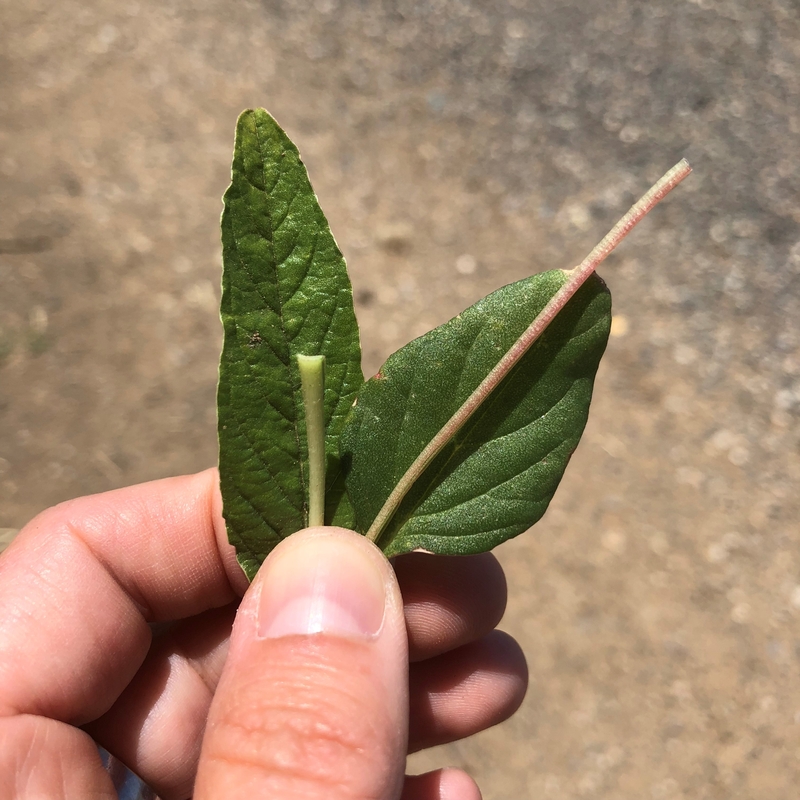 Leaf blades of waterhemp (left) and Palmer amaranth (right). Petiole differences between waterhemp (left) and Palmer amaranth (right). Male (left) and female (right) Palmer amaranth flowers are produced in terminal flower spikes that are held on separate plants. Note the presence of sharp bracts associated with the female flowers. 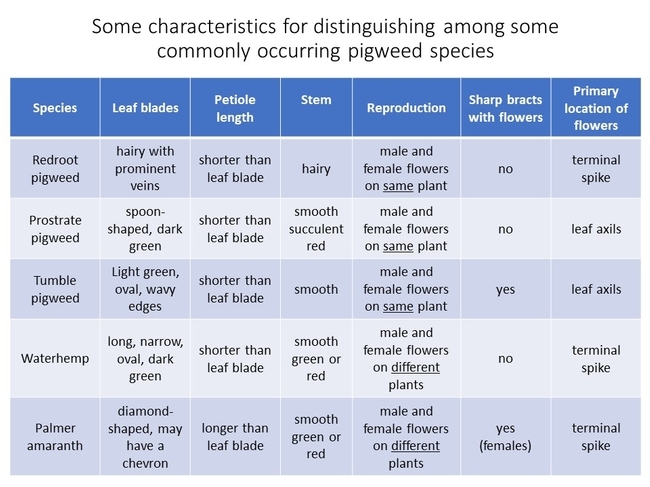 This blog post isn't meant to be the end all and be all of pigweed ID (many other species that occur in California aren't even included...), but it is meant to help you get started. Your local Cooperative Extension office personnel or Master Gardeners can also assist you. Clockwise from upper left: Tumble pigweed, prostrate pigweed, waterhemp, and Palmer amaranth. All photos by Lynn M. Sosnoskie. I am sharing this with our UC Master Gardener Program. Nice, useful article. I'm glad that you found the post to be useful! Thanks for sharing! This is very helpful as a handout to provide my students. Thank you.